The press making mischief? Or is there no smoke without fire at Manchester United? 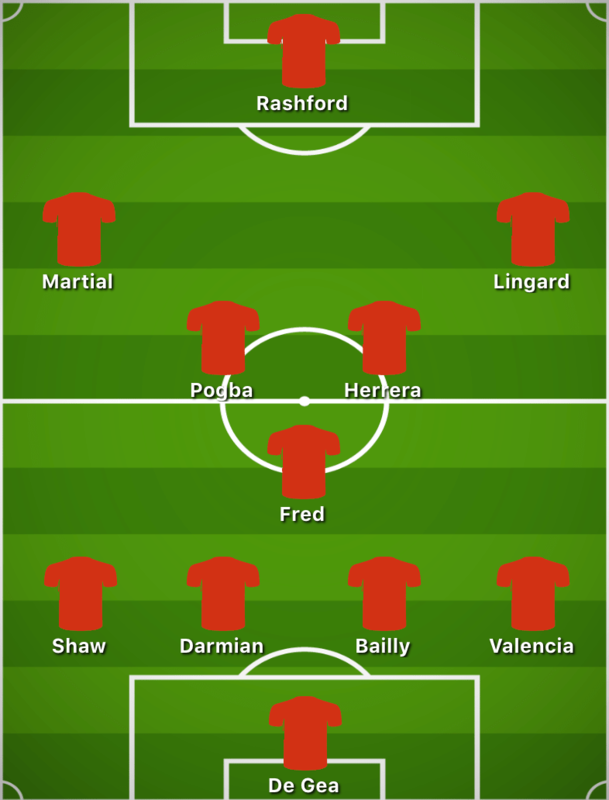 This team is put together of players who have either been reported to want to leave Man United at some point since the end of last season, or who have reportedly fallen out with José Mourinho. With eight of these players’ contracts expiring at the end of this season, 4 of which have no 1 year extension option, how much of this is true, and how much is without substance? If Mourinho stays at the club, how many players might go? Let’s try to separate fact from fiction. (1) David de Gea – Several papers have reported that De Gea has two issues in regard to his new contract, his wages – with £175,000 a week having reportedly already been turned down – and “assurances over the future direction of the club”. With Real Madrid’s interest having seemingly waned after a number of shaky performances for his national side, it seems more likely that De Gea would be willing to stay, but he wants Champions League football and there will be no shortage of suitors waiting to pounce if he does decide to go. (2) Antonio Valencia – Relations between Antonio Valencia and José Mourinho appear to have completely broken down following Valencia’s liking of an Instagram post saying “It’s time for Mourinho to go”. There was an immediate apology from Valencia, claiming he had just liked the photo of himself without reading the text below, but the fact that the text was in both Spanish and English gives his apology less credibility. Mourinho explained Valencia’s subsequent absence from the team as due to injury, and his recovery from mouth surgery, which Valencia responded to by posting a photo of himself in the gym with the text “work, work, work”. Mourinho bit back with “Antonio Valencia? I watched something funny in his Instagram where he says ‘work work work’ in the gym …. he should say ‘work work work alone because I am injured and I cannot train with the team”. But Valencia was clearly not injured having played 80 minutes for Ecuador in mid-November, a game where he grabbed a rare goal. Valencia was named as a sub against Crystal Palace, but now seems to have fallen below Young, Darmian and Dalot in the pecking order for the right back position, a dramatic fall from grace for a player who was number one choice right back and captain until the Instagram post. With his contract expiring in June and not having an option to extend, it seems hard to imagine the player staying whilst Mourinho remains manager. (3) Matteo Darmian – With his opportunities to play very limited and the signing of Diogo Dalot in the summer seeming to push him down the pecking order even further, Darmian understandably asked to leave in the 2018 summer window. There was plenty of interest from Italy, where he is still highly regarded, but according to Mourinho a big enough offer didn’t materialise and Darmian was condemned to another 6 months in Manchester. His recent selection for the Young Boys game might have been a case of putting him in the shop window, and there may well be further interest from Italy in the January window. (4) Eric Bailly – Although widely regarded to be United’s best centre back, Bailly seemed to be frozen out by José Mourinho after the shambolic 3-2 defeat at Brighton on 19thAugust. Finally recalled for the home game to Newcastle on the 6thOctober, United went 0-2 down after 10 minutes and Bailly was embarrassingly hauled off shortly after, seemingly scapegoated by Mourinho for the dreadful start. Since then, the Ivory Coast press have been reporting that Bailly believes Mourinho ‘has lost faith’ in him and has asked his agents to find him a way out of the club. AC Milan are widely reported to have shown interest in making a move for the player in the January window. Whilst the reports of a rift may be little more than press noise, the player’s quality could potentially lead some big clubs to come knocking and tempt Eric away. (5) Luke Shaw – It was all looking grim for Shaw in the Summer, having struggled to win a regular spot in the team following his horrific injury in 2015, and the rumours were flying around that he wanted to leave the club. But we then saw him giving up his Summer holidays to work with a fitness coach and he started the season in fine form, cementing his place back in the team and making the left back position his own. It seemed like a happy ending, but in November, Shaw was one of the four players criticised by Mourinho for ‘still missing a bit of…character, personality’ in an interview with Hristo Stoichkov in Spain. (6) Ander Herrera – Another player rumoured to be frustrated at a lack of playing opportunities, at the end of August, Ander Herrera was reported by Calciomercato to be reluctant to sign a new contract and considering a return to Spain. There seems little to substantiate this rumour, but with only 6 months left on his contract and with no extension option, the clock is ticking for Woodward to keep the player at Old Trafford. (8) Paul Pogba – The relationship between Paul Pogba and José Mourinho reads like a cheap soap opera. Publically, both have been careful not to say too much but both have admitted that they are not exactly the best of friends. After a number of Alexis Colby vs Crystal Carrington type cat fights in 2017-18, the couple seemed to have patched their relationship up, and Mourinho made Pogba vice-captain. This was followed by the famous training ground row, another Instagram fiasco which saw Pogba posting videos while United were losing, and which saw him stripped of the vice captaincy again, to the most recent dressing room row after the 2-2 draw with Southampton, in which Mourinho reportedly called Pogba a “virus” and said “You don’t play. You don’t respect players and supporters. And you kill the mentality of the good honest people around you.” The truthfulness of this recent rumour is difficult to ascertain as yet, but if true, it could spark a fresh stand-off between the two biggest egos in the dressing room. With Pogba’s agent Mino Raiola circling over the dying relationship like a buzzard, if Mourinho stays at the helm he may decide there’s no choice but to offload the mercurial midfielder. (9) Alexis Sanchez – It seems unlikely just ten months after his arrival at Old Trafford that Alexis would want to leave, but there’s no denying it’s been a troubled period for the Chilean, who has failed to find form or his best position in the team. Now facing a 6-week layoff after a hamstring injury obtained during training, several papers have reported that Sanchez has instructed his agents to find him another club. With this injury, a salary of around £500,000 a week to match and with Alexis turning 30 years of age on December 19th, the agents have got their work cut out for them, with only PSG offering a realistic, albeit slim, possibility of a repeat of their Di Maria rescue swoop. (10) Anthony Martial – Problems between Mourinho and Martial reportedly started very early on in the Portuguese manager’s tenure, after he stripped him of the number 9 jersey to hand it to Zlatan Ibrahimovic. A troubled season then ensued for the Frenchman, and having failed to make the French World Cup squad in 2018 due to the lack of playing time at United, Martial’s representative Philippe Lamboley went on record in June to say that Martial wanted to leave the club. Rumour had it that Mourinho seemed ready to let the player go, but the board had other ideas, playing hardball over the price and no deal was struck. A corner seemed to have been turned in November, with Martial being given an extended run in the team, finding form and finding the net on a number of occasions. However, following a quiet game against Young Boys, he found himself back on the bench, and in the same week became another of the players Mourinho accused of lacking character and personality in the Stoichkov interview. Having this time had a chance to show good form, and with the January window coming up, his agents might find it easier to secure a good offer for Martial than they did in the Summer. (11) Marcus Rashford – In a rather unlikely story, The Sun claimed in mid-November that Real Madrid had been scouting Marcus Rashford and that the player would be willing to go if he wasn’t given more first team football. You can’t really see Rashford finding it easier to command a regular starting place with Los Merengues, but being accused of lacking character and personality by Mourinho alongside three other players is unlikely to have made Rashford feel any more settled at Old Trafford. Andreas Pereira: Frustrated at having been given no chances after a promising start to the season, Pereira is widely reported as having told friends in Brazil he wants to leave to get more playing time, and with his contract ending in June, the English press claim Arsenal and Chelsea are interested in his services. Jesse Lingard: The last of the four players accused of lacking character and personality in the Stoichkov interview, Lingard’s relationship with Mourinho is rumoured to have deteriorated, but there are as yet no credible reports linking him with an exit from the club. Marouane Fellaini: One of José trusted soldiers, Fellaini rejected United’s new contract offer at the end of 2017/18 and a stalemate was reached. However, no other club managed to match United’s contract offer and Fellaini was forced to accept it at the last minute and stay at Old Trafford. Juan Mata and Ashley Young: Whilst there are no rumours of these players being unhappy at United, both are now 6 months from the end of their contracts, with no option to extend. It is possible that either or both fail to renew, or are released by Mourinho, and could become free agents in June. Chance they’ll go: Mata 5/10; Young 3/10.